The state of Wisconsin is defined by lakes and so is the University of Wisconsin. In fact, the UW-Madison campus runs along the shoreline of Lake Mendota, the “birthplace” of limnology (the scientific study of lakes) in North America. For more than 120 years, researchers have studied Madison’s lakes and on Friday, June 12 from 2 to 6 p.m., the Center for Limnology will open the doors of Hasler Lab to offer the general public a look at the world-class research currently going on just down from the Memorial Union Terrace. As the quality of Wisconsin’s waters is on the minds of concerned citizens, lawmakers and the news media, the Hasler Lab Open House will provide a unique opportunity to learn more and ask questions. Visitors will be able to talk with CFL Director Steve Carpenter about agricultural runoff and algal blooms. Professor Jake Vander Zanden will speak about invasive species and how they’re impacting water clarity in the Madison lakes. Professor and Director Emeritus John Magnuson can discuss climate change and what it means for our lakes. 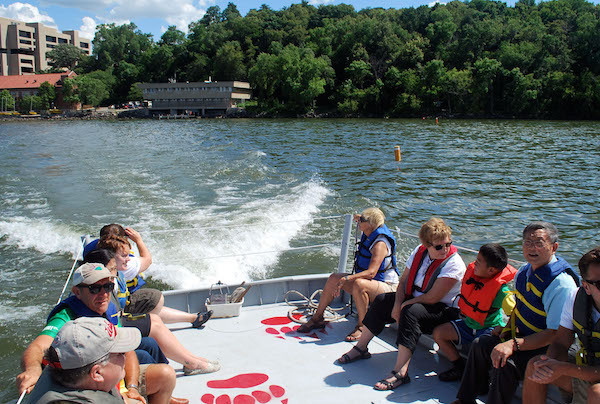 Visitors will also get a “behind the scenes” tour of the station, try their hand at using various research tools, meet the plants and animals that call our lakes home, and even get the chance to take a cruise on Lake Mendota aboard the center’s research vessel, the Limnos. Stations will explore topics like fish migrations, lake dynamics and future projections for the Yahara watershed. Kids will be able to make aquatic-themed crafts, and free Babcock Dairy ice cream will be served while it lasts. Bucky Badger will make a guest appearance at 3 p.m. Visitors are encouraged to come “rain or shine,” as most stations will be indoors and only the boat trips are weather dependent. Hasler Lab is at 680 N. Park St. There is limited public parking under the Helen C. White library and more at the City of Madison’s State Street Campus Garage on Lake Street.